The JASG Newsletter is a quarterly publication which seeks to promote business, cultural exchange, and mutual understanding between Japan and Georgia. The newsletter is circulated among the more than 800 Society members and community partners. Please send suggestions about articles or articles you might want to contribute to admin@JasGeorgia.org. The most current newsletter is below. Other archived newsletters in pdf format are at the bottom of the page. To advertise your goods or services, please contact admin@JasGeorgia.org. To take a shortcut to each article, just click the title below. 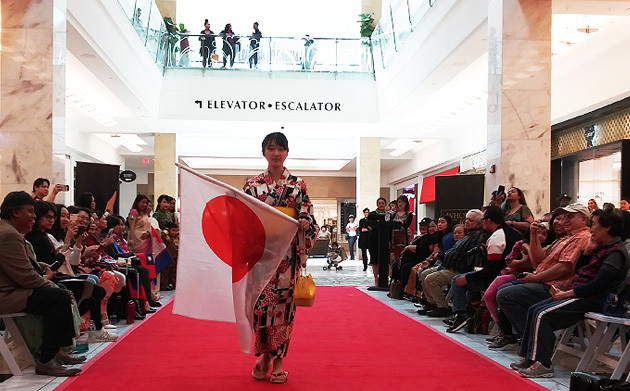 Forty-five years ago, the Consulate General of Japan in Atlanta was established to help connect Japanese citizens and businesses with Americans in the Southeast. The Georgia House and Senate passed a resolution recognizing the friendship and economic development between the two countries. In addition, on February 18 Consul General Takashi Shinozuka hosted a luncheon attended by Governor Brian Kemp, the senior executives from nine of Japan’s largest companies, politicians, and long-term Japan supporters at the Consulate residence. The event culminated in planting a commemorative cherry tree at the Consulate-General residence. Today its jurisdiction covers Georgia, Alabama, North Carolina and South Carolina. The current trade between Georgia and Japan is nearly $6.3 billion in trade with 650 Japanese affiliates employing more than 35,000 people. The JASG has nominated Americus, Athens, Dublin, and Savannah as cities in Georgia to participate in the inaugural GEN-J invitation program for community and business leaders to visit Japan from May 19-25. 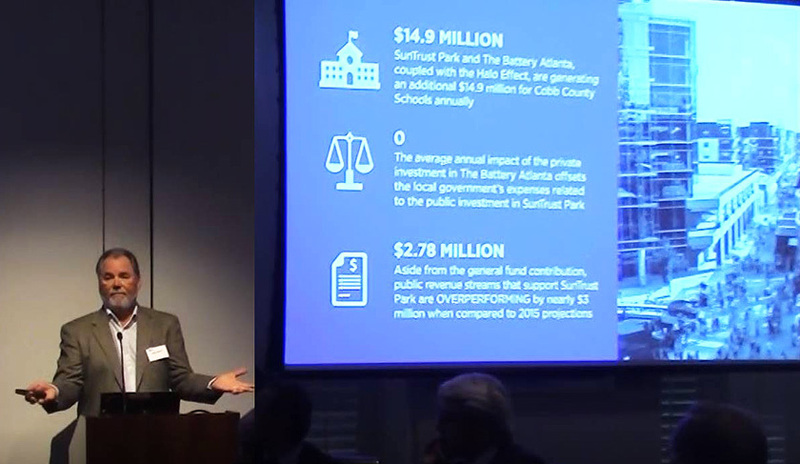 City leaders were selected for the all-expenses paid trip outside the metropolitan Atlanta. Americus has a strong international Sister City relationship with Miyoshi City; Savannah is a sister port with Shimizu; Dublin has a sister-city relationship with Osaki; Athens-Clarke County is home to Nakanishi Manufacturing. In June, Benjy Thompson from Bulloch County and Matt Poyner from Savannah will participate in June. The program is sponsored by the Japan Foundation that hopes participants will develop a network with Japanese business leaders and gain a deeper understanding of Japan and Japanese companies. As we look forward to spring, we also look back fondly on some of the more important events the Society hosted during the past winter. 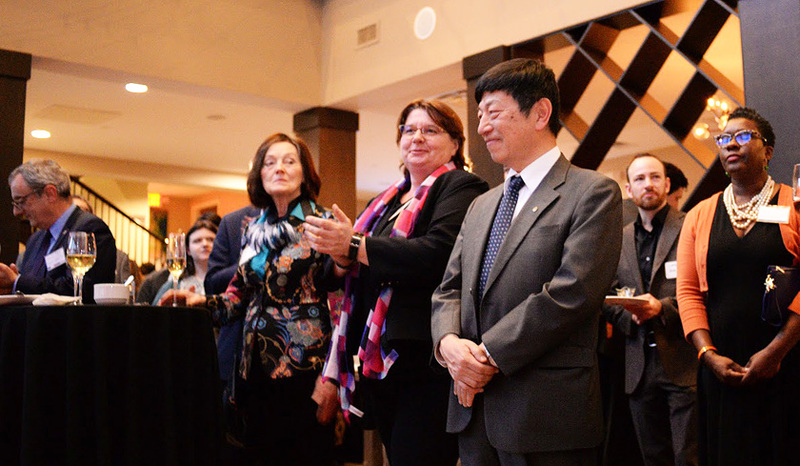 In December, we held our annual Bonenkai Holiday Gala at the prestigious Piedmont Driving Club - highlighted by a special toast by Consul General Shinozuka and recognition of our very own Alex Gregory for receiving the Order of the Rising Sun from the Japanese government. The evening was also filled with festive performances by Kyle Abbott and Mike Penny, shamisen duo crowd favorites at JapanFest, and Junko Fujiyama and her band. I would also like to thank Robert Banta for hosting us and all of our sponsors and silent auction donors who helped make the gala a wonderful success. 2019 started with excitement as Consul General Shinozuka received the King Center’s Forward Thinking Award for International Affairs in January. 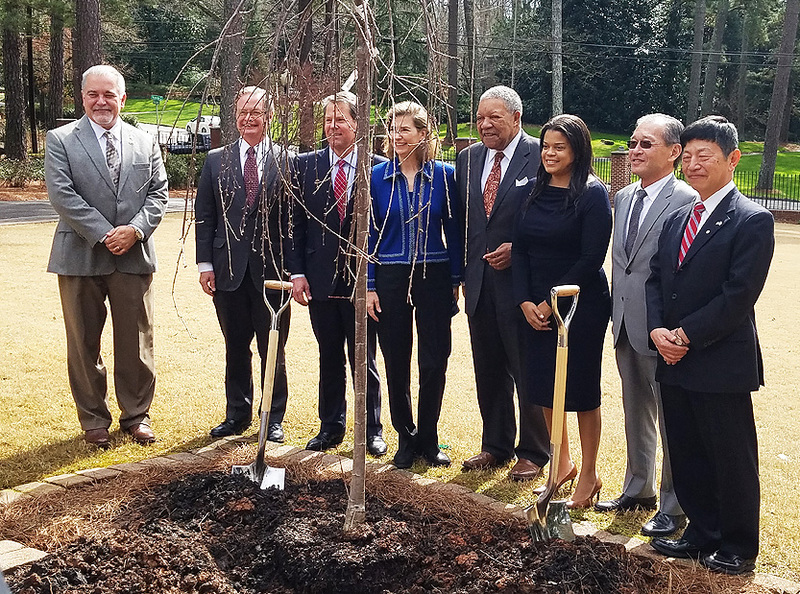 The Consul General also celebrated the Consulate’s 45-year anniversary on February 18 at a tree-planting ceremony at his Residence featuring Georgia Governor Brian Kemp. In addition, the Consulate was also recognized by Georgia House of Representatives and State Senate resolutions recognizing the anniversary. The JASG has had a busy few months with Yayoi Kusama Film Screenings at The High, US-Japan Now Business Luncheon at the Federal Reserve Bank, the Japan-Academic Challenge and Speech Contest, Obirin Global Business Program, the Sake & Wine, and the Atlanta Gladiators hosting a Japan-America Appreciation Day. Upcoming are a tour of Hoshizaki America, the JP Morgan's Foreign Exchange Seminar in April, our Annual Dinner in June, and of course JapanFest 2019 in September. If you are interested in being involved in promoting membership, planning events, assisting with educational programs, or have ideas on how we can better serve you, please don’t hesitate to contact the JASG office and join our efforts to build friendship here in Georgia. From March 28 to April 6, twenty-five Georgians will visit Tokyo, Kyoto, and Hiroshima on an all expenses paid study tour sponsored by the Japan Foundation. 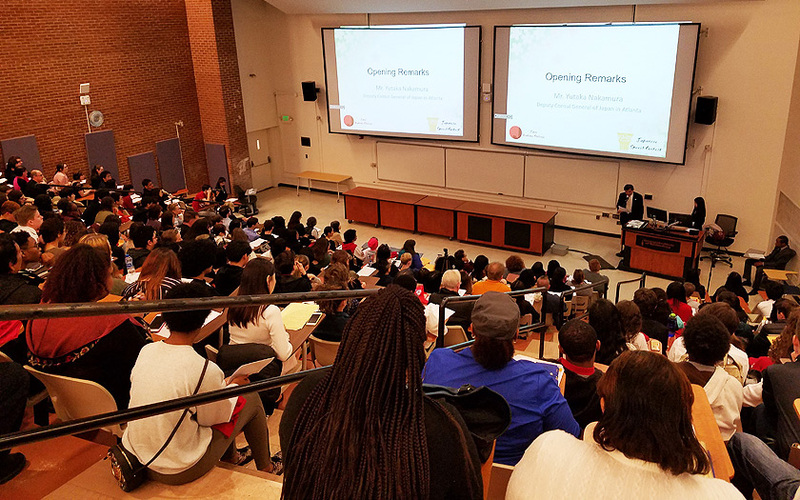 Participants in this GEN-J inaugural study tour include 18 high schoolers from Cambridge High School in Alpharetta, Decatur High School in Decatur and McIntosh High School in Peachtree City. Accompanying them are a JASG Board member and six chaperones including teachers, principals, and administrators. While in Japan, highlights include the famous Buddhist temple and Shinto Shrine in Asakusa, the huge outdoor Buddha in Kamakura, a ramen noodle museum in Yokohama, the Peace Museum in Hiroshima, the Japanese monkey sanctuary on Miyajima, and the glories of ancient Japan in Kyoto. They will also visit two companies with facilities in Georgia and a school. We look forward to hearing about their experiences when they return from such a busy schedule! 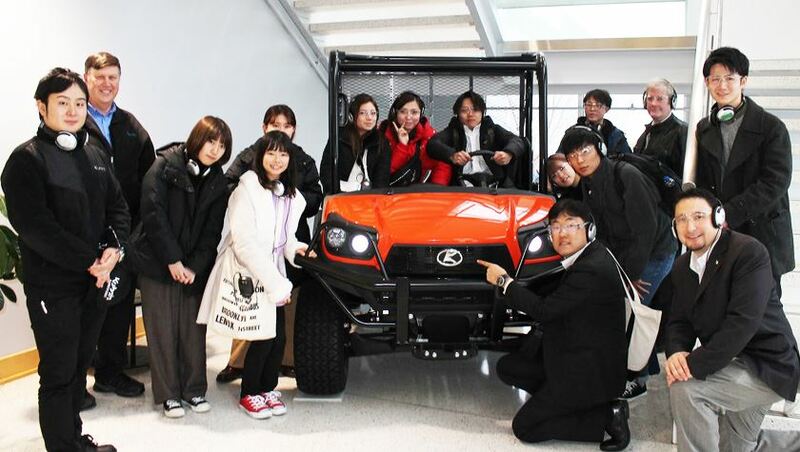 A second GEN-J study tour for high schoolers sponsored by the Japan Foundation is scheduled in November. The winner of the Japan Challenge and two other schools will be going at that time. My name is Debra Owen. I am honored to be the chaperone for the Atlanta delegation to the 2019 Asia-Pacific Children's Convention (APCC) in Fukuoka, Japan. The objectives of the APCC are to create awareness and appreciation of the nations on the Pacific Rim, to nurture cross-cultural understanding and friendships, and to facilitate global "Omoiyari" (compassionate) spirit. The children selected as Junior Ambassadors for the 2019 delegation are Jackson Edwards, Ethan Kittredge, Jada Nganga and Sasha Sedykh. Sam Katz (2012 JA) was chosen as the Peace Ambassador this year. My son Will was a 2017 Junior Ambassador and is now a Bridge Club member, so I understand parents’ preparations and emotions. I remember the spring and summer months of 2017 as we prepared Will for his journey. I was proud Will had been selected, but also nervous about sending my 11-year-old so far from home. I was a little teary-eyed when I caught my last glimpse of him at Hartsfield. For Will every day was an adventure. When he returned, although jet-lagged, he couldn’t stop talking about all his new friends from Malaysia, Taiwan, New Zealand, and of course, Japan; the unusual food and experiences; and funny misunderstandings. He had a superb host family and attended school with his host brother. We continue to keep in touch with his kind and generous Fukuoka family. For Will, this was indeed the experience of a lifetime. Now it is my turn. To prepare, I know we need to practice the song “We are the Bridge” as well as the kids' performance for the convention last day as well as go over basic skills. We will learn some basic Japanese phrases and customs like taking off shoes when entering a home. We will need to practice the song, "We are the Bridge," so they are familiar with it when they participate in activities at the camp facilities. We will also think about what the kids will wear and how to keep their clothes neat and tidy. We will review what to expect while at the camp, and at the host family. We will trouble-shoot possibly tricky scenarios, and what we might be able to do to address them. I was an exchange student to Japan when I was sixteen. After college I worked at the Japan Society for the Promotion of Science Liaison Office in Washington, DC and at Japanese banking institutions. For me, this is not merely a "trip to Japan," but an opportunity to take part in a more significant, cross-cultural education event. I look forward to sharing with the children, my host family, as well as the other chaperones, our cultures, languages, and ideas and spread the Omoiyari spirit! For more information on events scheduled between now and July, please visit the JASG webpage: www.JASGeorgia.org. If you have questions, please call the JASG office at 404-842-1400 or email Admin@JASGeorgia.org. 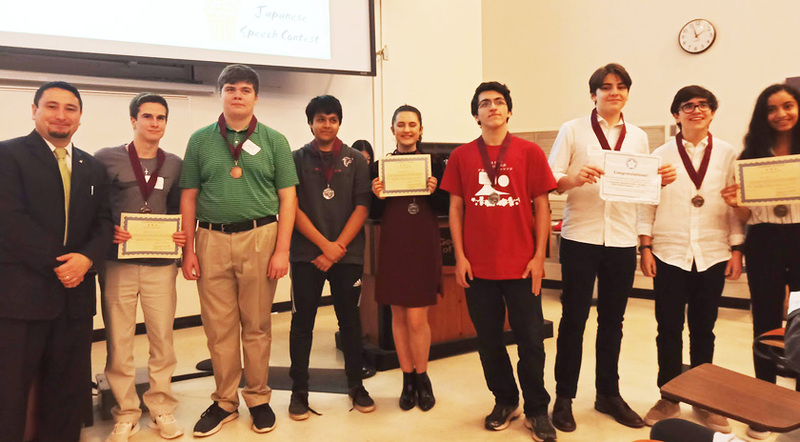 On March 2, nearly 100 high school and college students from the Southeast studying Japanese language participated in the 2019 Annual Japan Academic Challenge and Annual Speech Contest sponsored by Temple University Japan and the Japan Foundation. 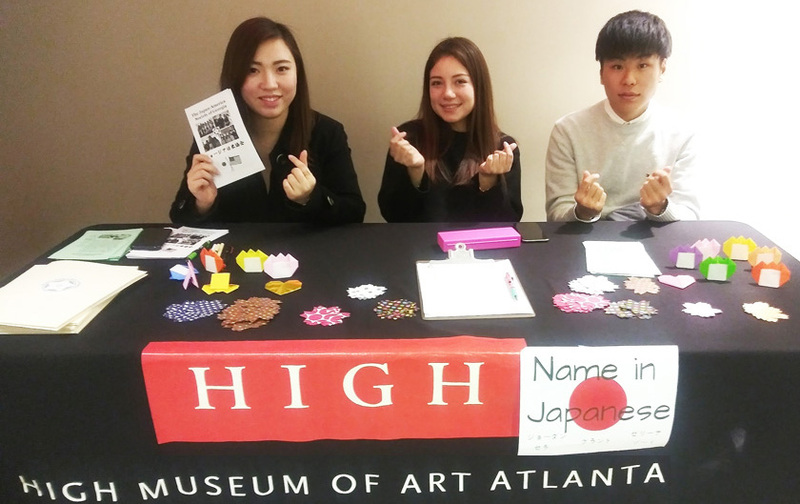 The event is co-organized by the Japan-America Society of Georgia, the Japanese Chamber of Commerce of Georgia, and the Georgia Association of Teachers of Japanese. This year it was hosted at Georgia Tech. The Challenge is a quiz competition testing high school students’ knowledge of Japanese culture, grammar and language. This year, a total of 21 teams from 5 Georgia high schools competed. There are four levels. The participants were Columbus High School, Hardaway High, Milton High, Roswell High and Riverwood International Charter High. Speech contest participants came from nine different universities. The winners were from Georgia State University Perimeter College and Georgia Institute of Technology. The highest-level winners of both the speech contest and the challenge have received all-expenses-paid trips to Japan. It’s been five months since I arrived in Atlanta. It’s been a time of listening, learning, and adjusting. Schools are so different from Japan – big and bright with lots of options. Kayobi-kai has taught me a lot about US culture and Nihongo-Eigo Kai has given me a chance to do research. The community is so interested in everything Japanese. Below are some of my many memories. What surprised me most was all the Japanese people, food, and cultural artifacts. Now that I have a car, I look forward to expanding my activities outside of the MARTA corridor. See you soon!! 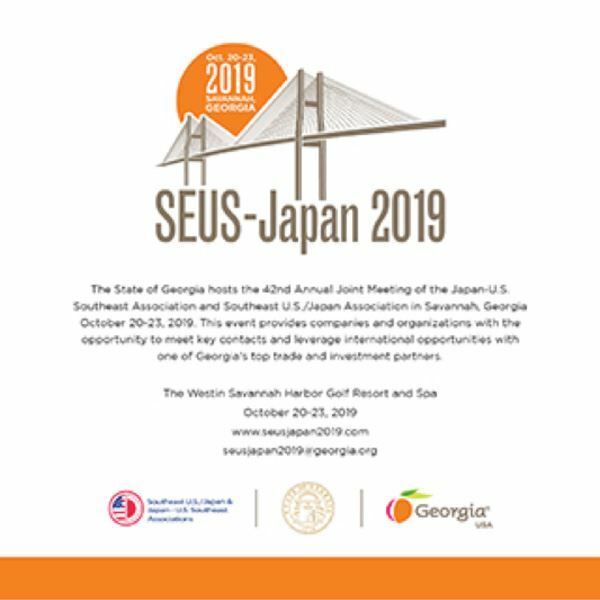 In its 42ndyear, the annual joint meeting of the Southeast U.S./Japan Association and the Japan-U.S. Southeast Association is scheduled to take place in Savannah, Georgia October 20 thru 23. Hosted at the Westin Savannah Harbor, the conference will slight shift focus away from governmental relations a program that provides useful takeaways for participants from both the public and private sectors. Of course this year is Georgia’s turn to host, and that means you can expect a program worthy of the #1 State for Business! 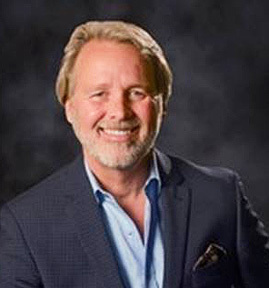 Our Chairman is Virgil Miller, Executive Vice President and COO of Aflac U.S. Given Aflac’s deep roots in Japan and its history in Columbus, GA, we feel the company is a natural fit. Virgil brings a wealth of experience, a great deal of charisma, and the warm, inviting nature that befits a host in the South. The agenda will highlight the collaboration in the US-Japan relationship. Possible topics include workforce development, logistics and supply chain, and trade relations. We also hope to feature some content on grassroots economic and cultural exchanges, showcasing unique collaborations between the Southeastern US and Japan. The intent is for this to be a content-rich program, so we are looking for people from both public and private sectors to share ideas or content beneficial to and engaging for attendees. Naturally attendees will still enjoy all the usual networking and relationship building, the highlight for SEUS-Japan attendees. Savannah is a natural choice for the SEUS-Japan Conference host city. Rich in history as Georgia’s first city established in 1733, Savannah also boasts the fastest-growing, most efficient seaport in the United States. This unique concentration of cultural and economic assets will allow attendees to enjoy more than the conference agenda. The usual golf outing will be on the schedule of course, but the city offers much more in terms of local sightseeing, culinary, and cultural opportunities. As Japan closes the books on the Heisei Era, we look forward to opening a new chapter in the SEUS-Japan narrative. Just as the US-Japan relationship has grown and evolved over the years, it must also adapt to the evolution in government and business relations over the past 42 years. We are no longer strangers to one another; we are longtime friends and allies with deep economic and cultural ties. As the digital age has accelerated the pace of both business and politics, the benefits of stability become more pronounced. Yet there is still much room for innovation opening new paths and new possibilities. This annual exchange rotates each year between the US and Japan. The 2019 summit will be in Hyogo Prefecture, just west of Osaka and home of the famous port city of Kobe. Thanks to generous support from the Japanese government, corporate supporters and volunteers, the trip costs less than $3,000, including flights, meals, and 3 hotel nights. The program centerpiece is the homestay for 3 nights with a Japanese family. People of all ages and many who have never been to Japan before will join us in Hyogo for the US-Japan Grassroots Summit. To register, please go to www.manjiro.or.jp. The 29th Japan-America Grassroots Summit will be held in Hyogo Prefecture. Hyogo Prefecture has fostered 55 years of international friendship and collaboration. I would like to extend my heartfelt welcome to all those coming to the Summit. Hyogo Prefecture faces the Sea of Japan to the north, and the Seto Inland Sea and the Pacific Ocean to the south. It is composed of various types of places, such as urban cities, agricultural regions, mountainous areas, and remote islands. Due to its diverse climate and culture, Hyogo Prefecture is often called “Japan in Miniature.” As such, diversity is the greatest charm of Hyogo. With many foreign residents playing active roles in local communities, proactive attitudes toward creating a multicultural society have taken root within the citizens of Hyogo. The Summit in Hyogo-Himeji will start at the World Heritage site Himeji Castle followed by local sessions elsewhere that feature diverse regional characteristics and resources. The final venue is Awaji Island, the stage of Japan’s creation myth. I hope many will come and directly experience the many charms of Hyogo Prefecture. I am sincerely looking forward to welcoming you in Hyogo. The Tomodachi Club, JASG’s Women’s Friendship & Culture Group, have expanded our activities and membership this year. Since the New Year, we have enjoyed two programs and luncheons. On Wednesday, January 9, 2019 we met at the Pricci Italian Restaurant in Buckhead for the program, “Yayoi Kusama, Infinity Mirrors.” Karen Johnson introduced her documentary film “Kusama-Infinity,” that was shown locally at the Tara Theatre and at the High Museum to accompany the Kusama exhibit at the High. Everyone enjoyed meeting Karen, seeing a film about Yayoi Kusama that was produced for the Tate Museum, and learning more about the artist’s life. 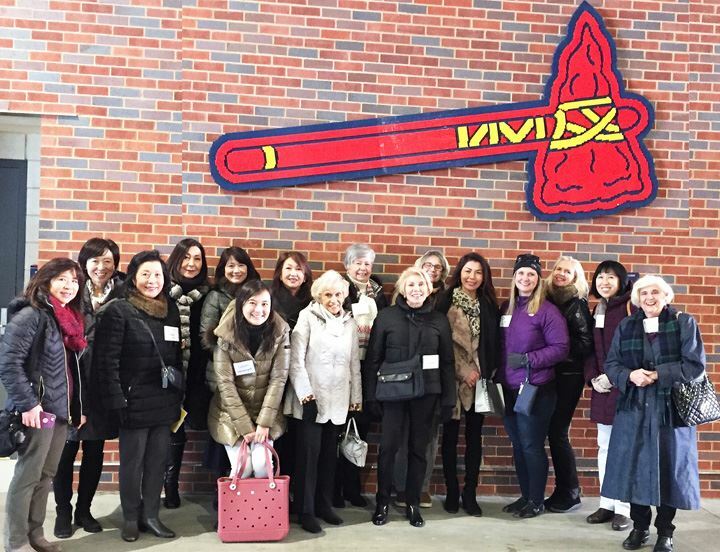 For our March 6th General Meeting, we turned from the fine arts to sports with a guided tour of SunTrust Park, the new home of the Atlanta Braves baseball team. During the tour we saw parts of the stadium not open to the general public, such as the press box, dugout, and the Delta Sky 360 Club. Following the tour, we had a casual lunch at the Yard House Restaurant located in the Battery Entertainment District. 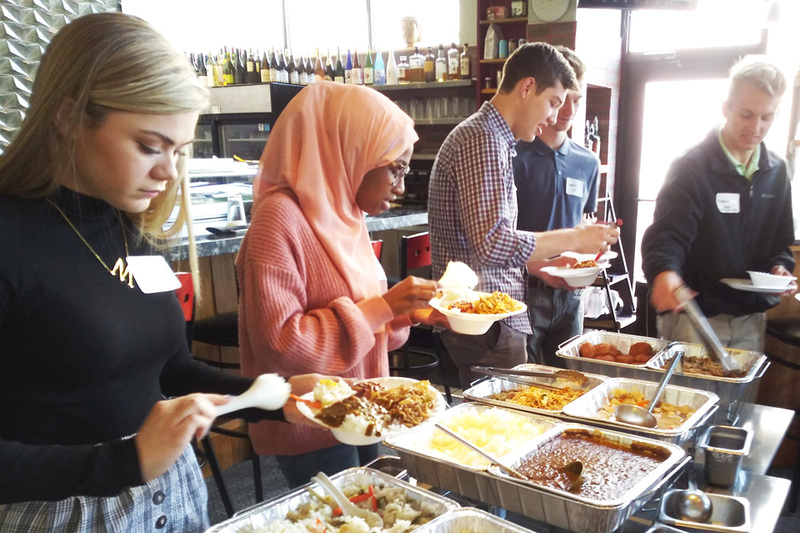 On Wednesday, May 1st, the Tomodachi Club will wrap up its 2018-2019 season with a General Meeting at Nakato Restaurant. Our program will feature Madoka Ito who will play koto music for us. Following our program, we will enjoy a Japanese lunch. 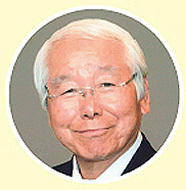 We hope that JASG ladies will join us at our May meeting and decide to become Tomodachi Club members. Over the summer, the four Tomodachi co-chairs will be very busy planning the five General Meetings for our 2019-2020 season. These meetings are scheduled for the second Wednesdays of September 2019 and January 2020, and the first Wednesdays of November 2019, March 2020 and May 2020. Further information about the program and venue for each meeting will be available in late August. 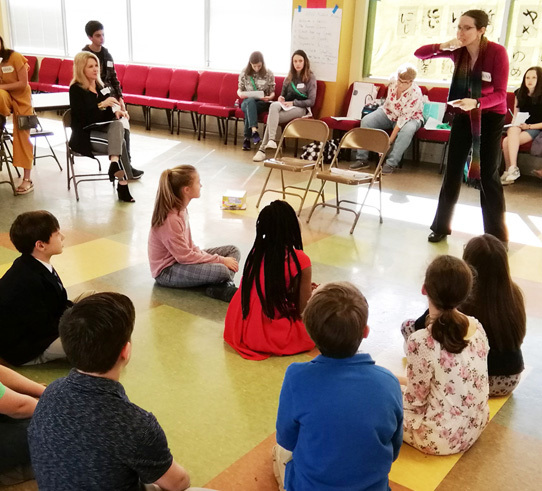 In addition, the Tomodachi Club has two small group meetings, in October and February, which are planned and organized by the small group co-chairs. The Tomodachi Club was established in October 1981 under the sponsorship of JASG to promote friendship, cultural exchange, and understanding among Japanese and American women. To become a member of our Tomodachi Club or for additional information, please contact Ms. Maki Murahashi at the JASG office, Tel. 404-842-1400 or email Admin@JasGeorgia.org. On January 10 and February13 the High Museum, in collaboration with JASG, presented a special screening of Kusama Infinity. JASG volunteers attended and set up booths of origami and Japanese [character] names. The recently released feature documentary film about the now world-famous Japanese artist Yayoi Kusama previously screened at Sundance and was a 2018 Critic’s Choice Award nominee. It reveals the true story of Kusama’s life and the many uphill battles she faced to arrive at her career peak today. Born in 1929 and turning 90 years old this year, Kusama was raised in the dark shadow of World War II, sewing parachutes in a war factory as a young girl. She suffered a traumatic upbringing with parents who opposed her interest in art and wanted her to enter into a traditional marriage arranged by her family. Early in her life she also began to experience hallucinations involving dots and flowers, which may have manifested as a result of other trauma she suffered in the fields of her parents’ seed farm. She had her first exhibition in Japan in her early 20s, but her art was largely dismissed as being strange, too different from the Nihonga art of the time. Upon the advice of iconic American female artist Georgia O’Keeffe, to whom Kusama had written, Kusama decided to set out for America. Traveling over the Pacific Ocean, she observed the waves as nets on the ocean’s surface. That formed the basis of her first major art development which she called Infinity Nets. Once Kusama arrived in New York, she struggled to make a name for herself and to achieve her goal of changing the history of American art. The film shines a light on Kusama’s instrumental role in the development of the American contemporary art movements of the late 1950s to 1960s, including the development of soft sculpture and new types of installation art. The film reveals that some of the artists she had influenced were recognized before Kusama. This disappointment contributed to her mental struggles, which had grown worse since her childhood. When her mental health finally broke down, she left the US and returned to Japan where she again faced rejection from her family and the larger society for her anti-Vietnam War naked art happenings in the 1960s in New York. Her health continued to decline, and after an attempted suicide, she voluntarily checked herself into a mental health facility where she has resided since the 1970s. A key art historian and curator in Japan resurrected her career in the 1990s. Now Kusama daily goes to her studio nearby to create her art. That art is now some of the most popular and highly regarded in the world, as evidenced by the recent High Museum’s sold-out exhibition Kusama’s Infinity Mirrors. The film also portrays Kusama’s Narcissus Garden, a version now on display at the Atlanta Botanical Garden. Producer Karen Johnson, an Atlanta resident, attended the High film screenings and answered audience questions. Karen worked with Director Heather Lenz for 14 years to bring Kusama’s story to film. When they first began, Kusama was largely unknown outside of art circles in America. Director Lenz says she hoped to bring Kusama the recognition she deserved. However, as the filmmakers struggled to raise money for the film, Kusama’s star rose dramatically, peaking with the major exhibition curated by the Smithsonian’s Hirshhorn Museum. That exhibit recently traveled to the High Museum. On January 9, Karen gave JASG Tomodachi Club meeting even more insight into Kusama’s story. Anyone can enjoy the film Kusama Infinity now available on iTunes, Hulu and Amazon! 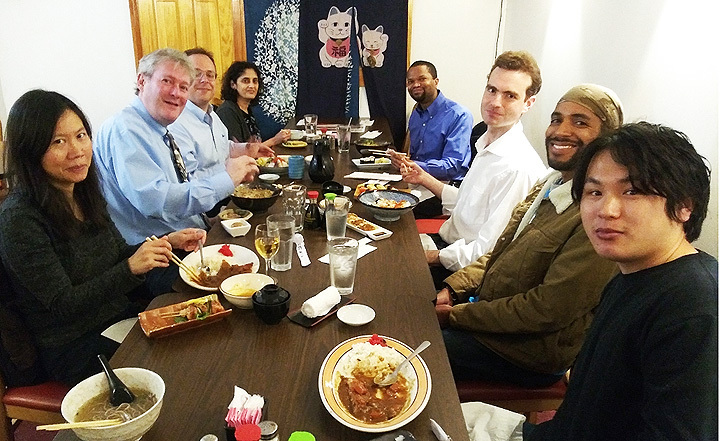 The JASG was pleased to once again host the Obirin University (Tokyo) Global Business Program from February 12 to 23. 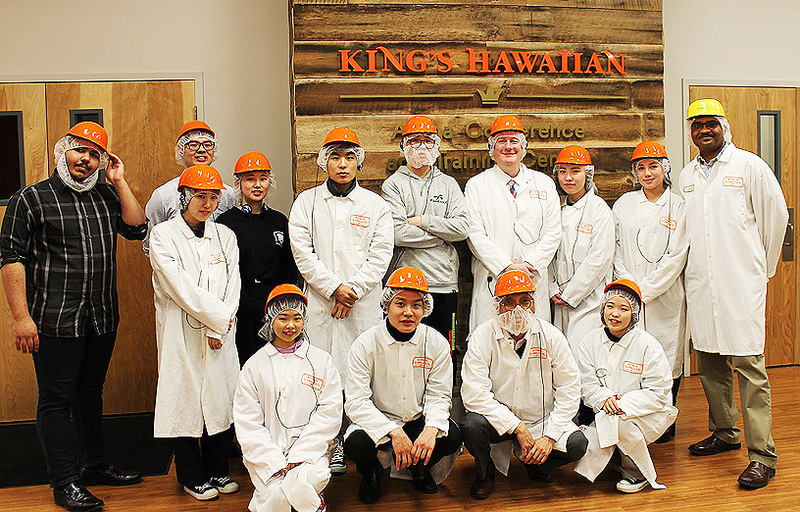 The Obirin students and two chaperones visited Georgia-based Japanese and US businesses to learn first-hand about international relations and global business strategies between Japan and Georgia. 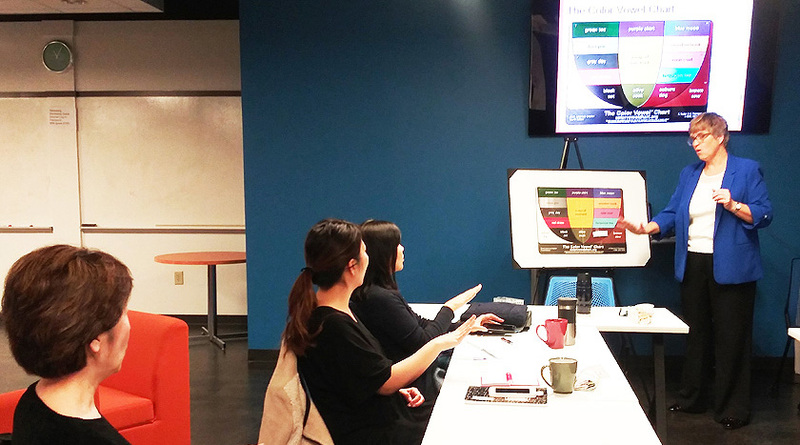 Thus, the Global Business Program focuses on understanding Japan’s place in the global arena, showing them first-hand the differences between Japanese and U.S. companies, and acquainting them with Georgia’s culturally diverse society. Tech and Georgia State campuses. Of course, the program was not all lectures and classes. The students received generous helpings of Southern history and culture from the civil rights movement to sports at an Atlanta Hawks game. They also visited and enjoyed the Georgia Aquariumand The World of Coca-Cola, Lenox Malland much more before their trip back to Japan. 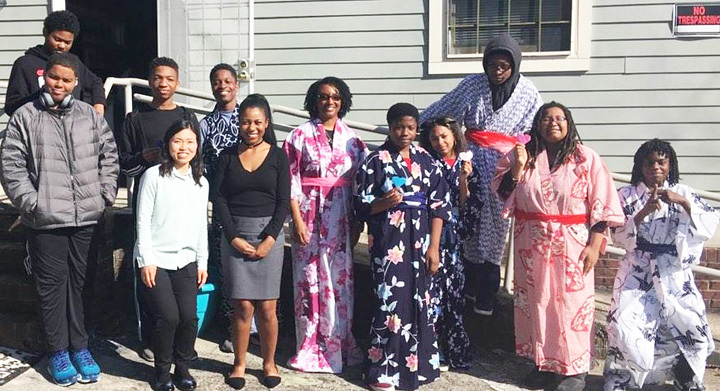 On March 5, sixteen Obirin students arrived for a semester of ESL at Mercer University and Georgia Tech, volunteer activities, and a JASG business practicum on the Obirin University Business Management Global Outreach Program. The next BM GO students arrive in August. If you are interested in being a host family or a friendship family for the August group of students, please check out www.jasgeorgia.org/Become-a-Host-Family. As part of its annual winter tradition, the JASG sent off 2018 in style with the celebration of the 38th Bonenkai Holiday Celebration Gala and Silent Auction on Thursday, December 13, 2018. Over 270 guests attended and celebrated the winter holidays at the Society’s End-of-Year Dinner Gala at the Piedmont Driving Club, one of the most prestigious private clubs in the South. The evening began with a before-dinner cocktail reception where guests could mingle with new friends and re-connect with longstanding friends while enjoying festive holiday lights. Famous Japanese singer-songwriter Junko Fujiyama performed during the reception before the program began with a toast by Consul General Takashi Shinozuka and a special recognition of our own, Alex Gregory, who received the renowned Order of the Rising Sun, Gold Rays with Rosette from the Japanese government. JASG Chairman Bill Strang commended Alex and presented a congratulatory letter from US Ambassador to Japan, William Hagerty. The highlight of the dinner was a Maru Batsu Trivia Challenge that team YKK won. 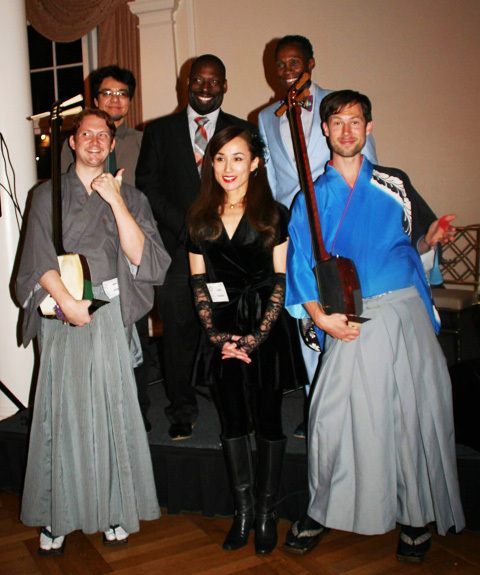 Traditional Japanese musicians Kyle Abbott and Mike Penny performed on tsugaru shamisen. After dinner guest were treated to a musical collaboration of Japanese and American performers playing their modern rendition of Japanese and American pop hits on the keyboard, shamisen, guitar, bass, and drums. Sometimes, the words we say are different from what we mean. The other day, my Japanese friend and I were together, and we overheard a man commenting on the price of food, which was about 7 dollars. He said, “I don’t even have to take off my shoes to count that high!” Later, my friend asked me what he had meant. She had understood every word, but his meaning was not clear to her. I explained that he had been joking. He meant that if the number was under 10, he could count on his fingers, but if it were over 10, he’d have to also use his toes, (so he’d have to take off his shoes)! Of course, he was kidding, and didn’t need to use his fingers OR toes, but it was just a funny way to say the number was low. For help understanding the strange things Americans say, contact us at Bigler ESL. We offer accent reduction and English coaching for all levels and ages. Below are some questions asked at the Academic Challenge and Maru-Batsu Quiz. How many can you answer? Q1. Write イin katakana and then write the kanji for ‘book.’ What is the meaning of this Kanji in English? Q2. Japan’s birthrate is the lowest in Asia, and its life expectancy is the highest in the world. True or false. Q3. What was the Chinese zodiac sign for 2018? Answer in Hiragana. Q4. Hello Kitty was born on November 1, 1974. What is her nationality? Q5. What do you say when you leave someone’s house in Japan? Q6. In the U.S., there are no federal holidays in March, April, June, and August. Japan has a public holiday each month except one. Which month in Japan has no national holiday?